Viewing these annual 5-year average temperature anomalies will encourage students to ask why this is happening to global mean temperatures. Students likely need to be instructed and coached on how to interpret these maps even though it is rather straightforward. Information on how the raw data was processed to derive the map is given here: http://data.giss.nasa.gov/gistemp. Temperature monitoring stations from around the world collect temperatures and analyze/compare the records year after year. This resource includes data sources and scientific references and some discussion about the reasons for working with temperature anomalies rather than absolute temperatures. Comments from expert scientist: A strength of this resource is that it is based on real data. While these are important datasets and should be presented in classrooms, the web page includes little scaffolding for most educators. Further background material will likely be needed. This animation and its individual frames are available in a number of formats. It is best to use the animation with the year overlay and have the temperature difference color bar available. The web page does not make clear that there are both videos and stills available (i.e., they should be separated in some way). 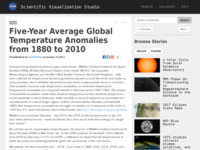 Visualizations of the anomalies changing year to year can be downloaded or educators could choose individual jpegs to make their own data collection. HS-P2.4:Develop and/or use multiple types of models to provide mechanistic accounts and/or predict phenomena, and move flexibly between model types based on merits and limitations. HS-P4.5:Evaluate the impact of new data on a working explanation and/or model of a proposed process or system.